Some art just points us at the direction it wants to take us and presumes that we’ll get there. Other art takes us gently by the hand to lead us towards its goal. 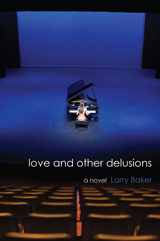 Larry Baker’s art in “Love and Other Delusions” does a bit of both, but most of the time it engages us more fully, in an deeply intellectual wrestling match with matters of the heart, if not the soul. And at its best, and for I what I suspect will be the case for many readers, the heart involved is our own. The asymmetries in “Love and Other Delusions” are profound, and help establish the fundamental drama of the piece. Alice is a privileged thirty-year old teacher who seduces one of her students, an intelligent, handsome, engaging, eighteen-year old. Danny is from a hardscrabble background. He steals from the theatre he works in to support his ill father, as well as a younger brother and sister. Their mother abandoned them long ago. And in walks Alice, beautiful, well off, confident, but older. Not quite their mother’s age, but close enough, with the lovers age gap proportionately decreasing over the next few decades and the affair less startling as the story unfolds. Alice ultimately loses her job because of the relationship, despite the fact that her long suffering husband Peter is the Dean of the department of the school where she works. Or maybe because of it. Who knows? Fortunately for Alice, she doesn’t really need the work, since Peter loves her and will support her, and while he must be heartbroken about her affair not only with Danny, but with apparently many other men, he never finds it in himself to leave her. In fact, for over twenty years, he lovingly hand rolls her cigarettes, a singular gift. Not exactly like handing the keys to your car to your drunk wife and sending her on a beer run, but with its own implications for the story. We never really get to know him–is he so in love that he will forgive her anything, or is he the most significant of her enablers? Or maybe he has his own indiscretions? We also learn that Alice and Peter may have a reason as to why both of them behave the way they do, a nearly unspeakable tragedy, which incidentally, deserves not much more than a mention in the story, but still pervades it. Enablers abound in their lives. Friends, past and future lovers, and those of us who sit idly by and watch our friends self-destruct, thinking it none of our business, whether it is or not. Both Alice and Danny are powerful personalities, both flawed, yet more powerful than those around them. Danny’s younger sister has one moment, but perhaps the only one of note before she fades to oblivion. His younger brother wanders in and out of the story, and while we hope he doesn’t get hurt, we don’t really know if he does or in what way. For one of her class and time, Alice of course has a therapist with her own flaws, which maybe are not so much her own, but perhaps of her profession. She too has an indiscretion on her hands, and interestingly enough, these women share a bit of regret, if not so much guilt. Kathy struggles, for all the right reasons, but fails, as she was likely doomed to. Yet another asymmetry. But who, actually, is Kathy? She too, has an ineffectual husband, which may reflect, actually a broader societal condition. Does anyone actually have an effectual husband anymore, given that the state of what constitutes “manhood” is in such transition? While contemporary American society wouldn’t say it actually likes ineffectual men, it recognizes feet of clay when it sees them, and if it doesn’t see them, it will likely do its best to create them for you. Danny too has his own flaws, his own indiscretions, his own affairs, and most vulgarly, thievery of a variety of sorts. But what is theft? Does theft relate only to the material of our world? Theft involves breaking an agreement with respect to private property; adultery is breaking an agreement with respect to sexual exclusivity. Maybe in the end Danny rises above both kinds of theft, maybe not. But really, it’s tough to like a thief who steals material things. Ironically, it’s easier to look the other way when the thief steals not money, but promises. But really, would you rather have your wife steal a car, or sleep with your neighbor? The former gets her jail time, and while the latter may be devastating, everyone involved will most likely construct some sort of rationalization that is eventually publicly acceptable. Adulterers rewrite their lives every day, yet a car thief is always a car thief. But rising above it all is the story. Cast this story in another time and place, in the middle of a war perhaps, or at a pivotal historical moment, Baker’s storytelling would have been easier, if not more profound. Set instead in modern St. Augustine and Atlanta, places where theaters, park benches, cell phones and credit cards work as significant props to the plot, his chore is more difficult, and likely more meaningful. Why? Because the drama is created by the characters, not by external forces. As such, it becomes internal to us as well, because of likely shared experiences with the protagonists. Most of us are not identifiable cogs in the engine of history, but all of us hope that we would rise to the challenges if we were, as do the great characters of literature. Contrastingly, we, and those around us, live lives full of indiscretion, lies and lust, if not adultery. Or thievery. Cause then is the matter of our own hand, not the product of great historical forces beyond us. Which is, of course, more real. And common to us all. Baker’s gift then is that he creates not only a story of Alice, Danny, Kathy and Peter, but a story of ourselves. Like our players in the play, our lives are sticky–no–doughy. Doughy with thorns. And we recognize the places where the characters find themselves, geographically, emotionally, and if we’re lucky, physically. We also recognize their decisions, and even if we don’t necessarily agree with them, we can empathize. Baker writes well enough that their pain is our pain, their joy ours, and their seductions familiar and even titillating, even if uncomfortable. Literary name dropping is an easy way out of a description of an author’s work in familiar literary terms, but a convenient crutch when I need one here. Drieser comes to mind at times–especially in “An American Tragedy;” Flaubert when I see resemblances between Alice and Emma Bovary, and not to go overboard, the interactions and settings here remind me of the suburban worlds of Updike and Irving. There is another element to Baker’s work that I recognize in at least one of his other books–”A Good Man,” and that element is how he weaves in and out of clarity and opacity. The clarity is in the richness of description, of characterization, and of language. And just when you start to think you know what is going on, boundaries become fuzzy, nearly opaque. Time becomes a character, and characters blend in and out of each other, and it’s difficult to tell who is who, and when and where we are. And when Love and other Delusions is at its very best, we ARE Alice, or maybe another character, because those of us who are old enough to have been around the block a time or two and have taken and or given our share of lumps, share her story. Or his story. Or at least a part of it. Maybe we are her story. And we may not like it. But we know we aren’t alone. And with respect to love, is it indeed the delusion Baker asserts in his title? The cynic says of course it is. No question. The romantic replies, maybe. But what better does the world have to offer? Most of us will take love when we can get it–and its delusions. As did Alice.